A root canal is needed when the nerve of a tooth is affected by decay or infection. In order to save the tooth, the pulp (the living tissue inside the tooth), nerves, bacteria, and any decay are removed and the resulting space is filled with special, medicated, dental materials, which restore the tooth to its full function. Having a root canal done on a tooth is the treatment of choice to save a tooth that otherwise would die. Many people are concerned about avoiding root canal pain, but the alternative is tooth removal, which is ultimately more costly and will cause significant problems for adjacent teeth. 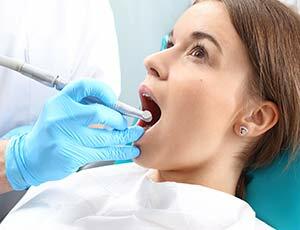 Although it is a dental procedure, the cost of a root canal is less than an extraction. Root canal pain can also be managed successfully, and root canal recovery is generally simple. Root canal treatment is highly successful and usually lasts a lifetime, although on occasion, a tooth will have to be retreated due to new infections. While the tooth is numb, a rubber dam (a sheet of rubber) will be placed around the tooth to keep it dry and free of saliva. An access opening is made on top of the tooth and a series of root canal files are placed into the opening, one at a time, removing the pulp, nerve tissue, and bacteria. If tooth decay is present, it will also be removed with special dental instruments. Although you may feel some general discomfort, direct root canal pain is minimal because the affected tooth is numb. Root canal recovery is simple, and any residual root canal pain should not prevent you from going about your day. There may some mild tenderness surrounding the tooth for several days, but the tenderness will subside quickly.